My twenty-third ground of 2016 was on Tuesday 15th November at Bonnymead Park in Amesbury, Wiltshire. 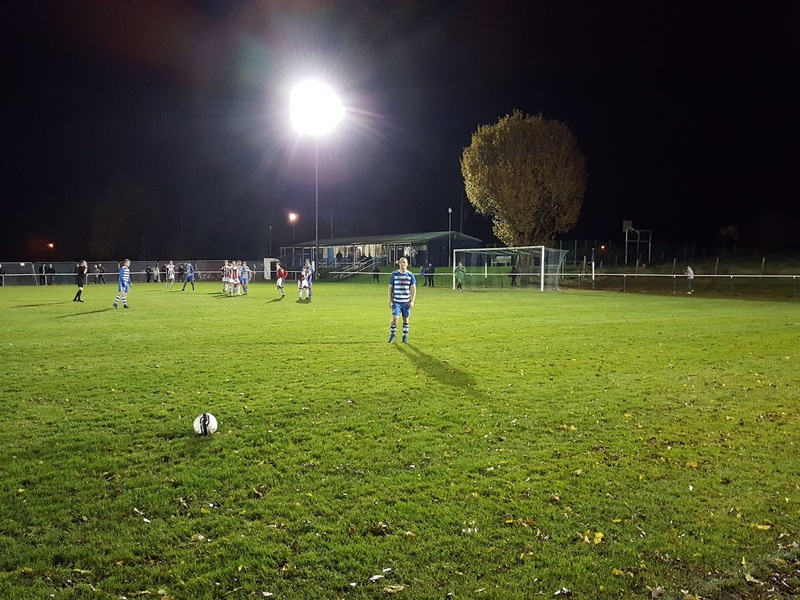 The match was Amesbury Town vs. Sholing in the Wessex League Premier Division. Bonnymead Park lies to the west of Amesbury in a rural setting. The football ground is part of a recreation ground which also contains a skate park, basketball court, playground and a large grass area. The closest railway stations to the venue are Grateley or Salisbury, both of which are around 8 miles away. The northern end of the ground has a flat standing area directly behind the goal with a grass bank extending up from this area. There are then a couple of standing areas at the top and a park bench for seating. The clubhouse is in the north-east corner and as well as housing a small bar also contains the players and officials dressing rooms. This has a roof extending out to form a canopy providing a decent covered viewing area. 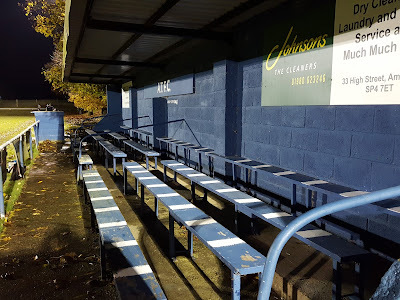 The only stand in Bonnymead Park is level with the half-way line on the eastern side of the park. This small stand has 4 rows of wooden benches and the two dugouts are placed either side of it. The remainder of this side as well as the whole of the western and south sections of Bonnymead Park are given over to uncovered standing. 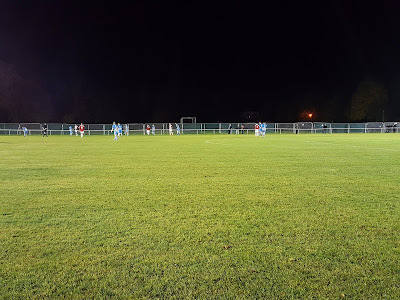 Sholing thought they had taken the lead in the 12th minute when Jamie Bulpitt went through on goal and brushed off defender but just as he was stroking the ball past the keeper the ref stopped play for his foul on the defender and disallowed the effort. 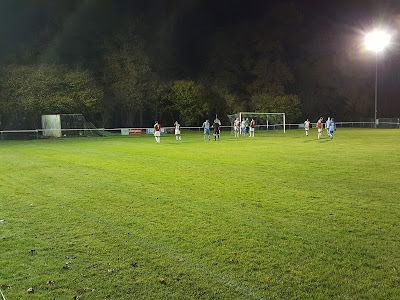 The visitors did not have to wait much longer to have a goal recognised though - in the 19th minute Zac Mouland did well to cut in from the right wing and his drilled shot took a deflection to take the ball away from keeper and into the bottom corner. Just before the half-hour mark Amesbury could've pulled level when Curtis Angell had a shot cleared off the line from a corner. As it turned out this was the high point of the match from Amesbury as Sholing dominated from this point onwards. 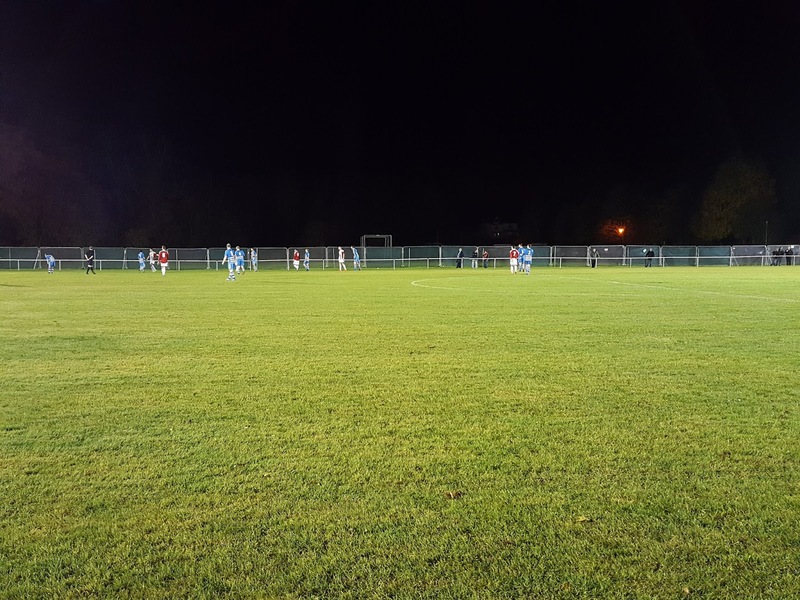 They had another goal disallowed in the 30th minute when a long ball found Lee Wort who rounded the keeper and netted only to see the flag go up for offside. Wort was disappointed for barely a minute though as from the restart Byron Mason broke into the box and though his shot was saved Wort was able to tuck the rebound into the empty net. Amesbury were under real pressure and 60 seconds after this they headed the ball off the line from a Sholing corner. The hosts stablised enough to keep the score down to two at the break. In the 53rd minute Sholing went 3-0 up after a Amesbury defender completely missed the ball when trying to clear it allowing Dan Mason to slot in from two yards out. Sholing had another header cleared off the line in the 63rd minute but a couple of minutes after this they went 4-0 up when the ball was crossed in from the right and Byron Mason's shot squeezed past the keeper and over the line. The 5th goal occurred in the 83rd minute and was a bizarre one stemming from the linesman flagging for a foul. Amesbury reacted to this by stopping but the referee had not blown his whistle so Sholing too advantage and swung the ball into the box for Lee Wort to head into an empty net. An emphatic win was rounded off in the final minute of the ninety when a Sholing counter attack saw the ball crossed from the right and Nick Yeomans was able to get in front of his man to steer home.